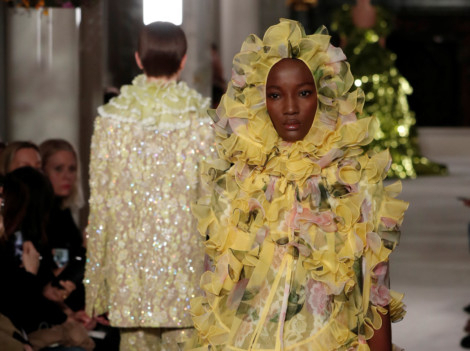 Italian fashion label Valentino created a dreamlike ode to spring on the catwalk in Paris on Wednesday, as models appeared to float down the runway in a series of vaporous dresses adorned with shimmering flowers, oversized ruffles and feathers galore. Fashion veteran Naomi Campbell wowed in an enormous half sheer, all-black gown at the close of the Haute Couture show. But softer pastel tones and delicate floral patterns dominated other looks, as celebrities including Celine Dion looked on in the audience. Models wore feathers on their eyelashes in a presentation that almost resembled an extravagant masked ball. The brand has long been go-to for Hollywood movie stars, with creations by its now retired founder Valentino Garavani, whose magenta red gowns became a signature trait, featuring heavily during awards season. 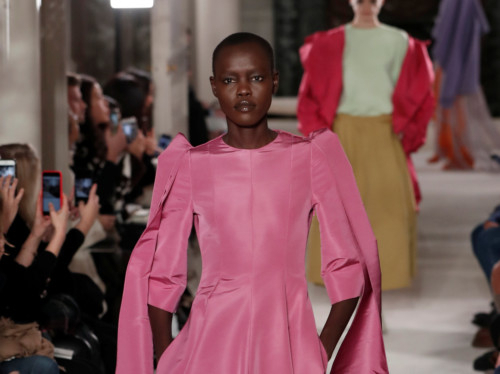 Current creative chief Pierpaolo Piccioli’s bouffant dresses, and oversized designs in sumptuous taffeta and vibrant colours have earned him plaudits from a fashion forward crowd and a clutch of awards. The label’s Qatari owners, investment vehicle Mayhoola, had examined plans to list Valentino on Milan’s stock market, sources told Reuters in late 2017, although the company has been evasive about such plans since. Haute Couture Fashion Week, which runs until Jan. 24, allows an elite club of top-end designers to show off elaborate creations, which are not mass-produced for stores but tend to be sold to a single client.